Q. Where did the elements for Swimming in the Moon come from? After I finished When We Were Strangers, HarperCollins was interested in either a sequel or another exploration of the immigrant journey. 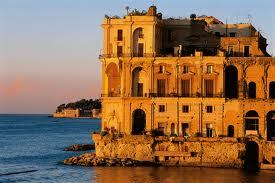 I had in mind the mysterious, enchanting image of the Palazzo Donn’Anna you see below. I was also interested in themes of daughters caring for mothers and workers struggle of the early 20h C. Vaudeville just came to me as an intriguing setting; I’d lived near Cleveland. Once I had these pieces, I began developing characters and a plot and then researching the elements. Q. What was the hardest part about writing a second book? Once you have a model that “works,” that got an agent, a publisher, and then sold, of course there’s the lure to re-create that model, which is bad idea since that means ignoring the needs of the current project. Fortunately, as I got more and more invested in Lucia’s story, that lure faded. However, one big difference with Swimming in the Moon is that I had a firm (and terrifying) deadline. When I wrote When We Were Strangers, I had no agent, no editor, just me writing to fulfill small deadlines for my writing group. Deadlines have an amazing way of keeping you pushing forward and into the story. Q. The Naples Nightingale is such a fascinating character. Is she based on anyone you know? Not really. I think it often happens that a parent has a passion and a talent (in this case singing) which the children don’t share. My father was passionate about science and mathematics and none of us were, particularly. I think he couldn’t get why not. Examples of the agonizing situation of balancing one’s own life and needs with those of a sick or dysfunctional family member are all around us. Ultimately, though, I created the Teresa character and thought and wrote about and imagined her enough to make her real for me. Q. Were there images that inspired you for When We Were Strangers? 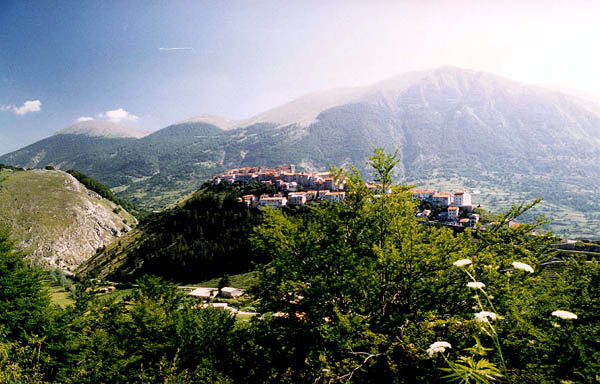 Yes, here is the town of Opi, very small, as you see. I kept this image before me to visualize Irma’s isolation and how strong her ties were to the one place she knew. 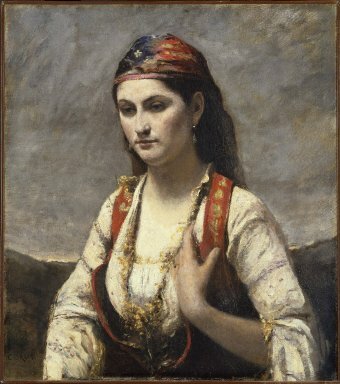 The portrait is one that I saw in the Brooklyn Museum of Art: Corot’s “Young Woman of Albano.” The painting was done in the 19th C, and Albano is near Rome, so the dress would be different, but the strength, the modesty, self-possession and the grace of the figure spoke to me of Irma and I kept a postcard of the portrait over my computer. I might be thinking about a theme and then a plot idea comes to me. It’s as if big soap bubbles follow you around over your head and sometimes they just pop together. Many of my short stories and my first two novels were set in Italy because I lived there from 1990-2000. In a novel, I go over and over a scene and each time you see more and feel more and hear more. Q: How much time do you invest in research? A lot. For a historical novel, the research is intense. You need to research much more information than you actually use, which is like the visible tip of an iceberg. What did people eat and wear? What music did they hear? What options were available to them? What did bread cost? Because you are creating in your head the context of the story, you have to know the world the characters live in before you can choose from that context the elements that you will actually articulate. I also find that research is in no way separate from the creative process. Once you have your plot and character in mind, they function as magnets when you are doing your research and the barest, driest factoid can open a scene for you or create a deeper vision of your character. A novel is driven by the characters and the challenges they face in a given historical context. It shouldn’t read like the candy coating on a historical or sociological treatise. And further, since I set both novels in the first person, any specific of time and place, any description must reflect what the protagonists, Irma or Lucia would see and understand and find significant at that moment in her journey. Q. Do you have readers comment on your work as you go? For When We Were Strangers, I gave each chapter at least once to the members of my writing group and honestly could never have finished my first novel without their encouragement and critiques. Then I worked with my agent and then the editor. For Swimming in the Moon, I shared chapters with a couple trusted reader-friends, and again with the agent and the editor. Rarely will a good reader-critic tell you “Don’t do A, do B,” but rather will say something like: “I feel X and Y. Is that what you want?” Then it’s up to me to find a solution. I write for an audience and it’s invaluable to have early readers honestly reflect back what they feel. Sometimes, ironically, you know your characters so well that you lose track of what is obvious to you that might not be obvious to a reader. Whenever I can. I work part-time and have a family, friends and various causes I’m committed to, but it’s also true that I spend an insane amount of hours in front of a computer. It’s like anything else that you want to do well. You don’t count the hours. I don’t mean to be catty but if you’re asking, “OK, exactly how many hours a week will it take to be a good parent?” maybe you better not be having children. But on the other hand, if it’s something that comes from the heart, there’s a deep satisfaction. I get a lot of pleasure from working very hard on a paragraph, a scene, on figuring out whether “a” or “the” is better in a given sentence, what expression, exactly, a character might have, where two people stand in a scene and what is true for them at that moment.